Maria Meza desperately sought safety for herself and her children. The 39-year-old Honduran mother had trekked northward on the migrant caravan, arriving in Tijuana in November. She and two of her daughters were among hundreds of asylum-seekers tear-gassed by U.S. border agents. 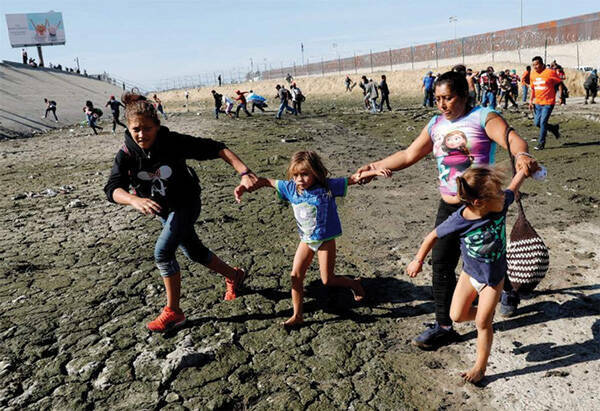 A Reuters photo of Maria and her girls fleeing clouds of tear gas went viral, provoking outrage at the administration of President Donald Trump and his draconian anti-immigrant policies. But it also brought Maria unwanted and potentially life-threatening notoriety, as right-wing media outlets like the Fox News Channel fanned the flames of racial hatred day and night. Just this week, she entered the U.S. and applied for asylum, but only when two members of the U.S. Congress camped overnight with her and escorted her with her children through a port of entry near Tijuana. Jakelin Caal Maquin did not have congressional protectors. The 7-year-old Mayan girl from Guatemala crossed the border into New Mexico with her father, Nery Caal, seeking asylum with about 160 other migrants. They were taken into custody and, after more than eight hours of detention, Jakelin began having seizures. Her body temperature spiked to 105.7 degrees F. She was taken to a hospital in El Paso, where, on Dec. 8, she died of dehydration, shock and liver failure. Abdullah Hassan is not an asylum-seeker. He’s a U.S. citizen. But the 2- year-old suffers from epilepsy and hypomyelination, and, at the time of this writing, is on life support, near death, at a hospital in Oakland, California. Abdullah’s father, Ali Hassan, also is a U.S. citizen, and has been by his side throughout his ordeal. But his mother, Shaima Swileh, is a Yemeni citizen and, as such, can’t enter the U.S. because of Trump’s “Muslim Ban,” which bars people from five majority-Muslim countries -- Iran, Libya, Yemen, Syria and Somalia. The family had been pleading with the U.S. State Department for over a year to grant Shaima a waiver so she could be with her son in his final months. On Monday, as it looked like he would soon die, they filed a lawsuit. As media attention grew, the State Department granted a waiver at the last minute, and she began the long flight to California. CAIR, the Council on American-Islamic Relations, is coordinating her immediate travel from San Francisco International Airport to her son’s side. He is unconscious, and is not expected to regain consciousness. Last June, then-Attorney General Jeff Sessions issued a new rule blocking people from using some of the most common reasons for seeking asylum: gang-related or domestic violence. A lawsuit challenging the rule was assigned to U.S. District Judge Emmet G. Sullivan. Sullivan was in the news this week, presiding over the sentencing of Trump’s former national security advisor and now admitted felon, Gen. Michael Flynn. Last summer, as the case challenging Trump’s restrictions on asylum was making its way through the court, Sullivan learned one of the 12 plaintiffs and her daughter was being deported back to El Salvador, facing the very violence they fled. Sullivan ordered the plane turned around, and threatened Sessions with contempt of court if his orders were not followed immediately. Immigration policy is a matter of life and death, most tragically impacting the most vulnerable among us. As Judge Emmet Sullivan shows, the courts can offer relief. But nationwide grass-roots organizing and massive media exposure are needed to reverse the abomination of Trump’s war on migrant children.